So ever since the study last month that linked butter-flavored microwave popcorn to Alzheimer’s, I’ve been a little wary about eating it. Not because I’m actually worried about getting Alzheimer’s (I’m pretty sure I’ll be finished off by a flesh-eating virus well before that), but more because I can’t pronounce the chemical (diacetyl) scientists believe is causing all the trouble. and it’s mighty tasty to boot. To begin, pour enough cooking oil in your pan to coat the bottom. Throw in a pat of butter and heat. When the butter is melted, sprinkle salt and garlic powder and swirl it all around a little. Add enough popcorn to cover the bottom of the pan and turn heat to high. As the kernels start popping, put the lid on and shake occasionally, to make sure all the popcorn is evenly heated and popped. When the popping slows, remove from heat and serve. See those little brown flecks? That’s the garlic powder, which has cooked and now gives everything a lovely roasted-garlicky taste. My husband taught me that. Leave out the garlic powder and make caramel corn by melting 1/2 c butter and 1/2 c brown sugar. 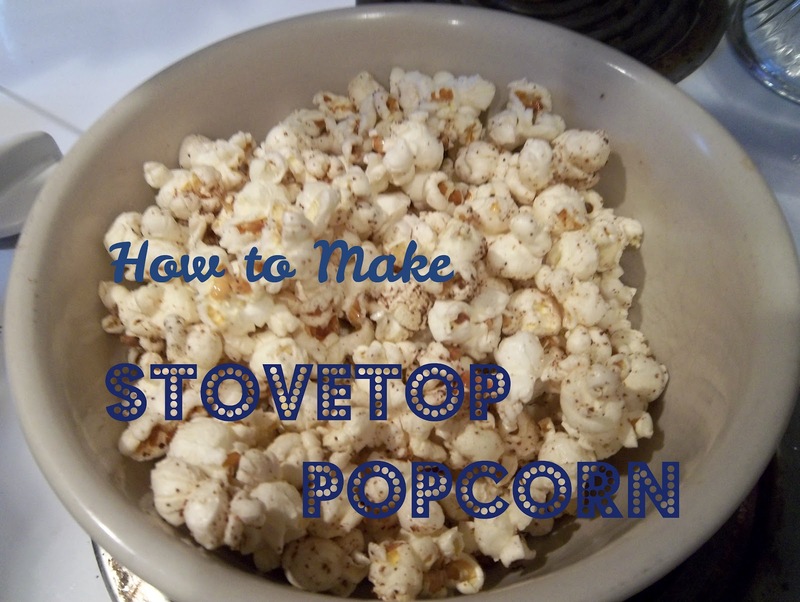 Stir together and pour over popcorn, bake in the oven for 10 min at 350 degrees. This is such a great fall-feeling recipe — today was cold and kind of dreary and we had mulled apple cider and popcorn for our afternoon snack. Mmmmm. Thank you for visiting Peace but Not Quiet! I’d love it if you’d take a minute to like me on Facebook.